Scatter Diagrams (or Plots) are used to visually represent data for further analysis in correlation or regression. The diagram shows a pair of numerical data, one for each axis (horizontal and vertical with are x-y respectively). They explore associations between two variables and the "x" variable (input) is varied systematically and the "y" (output) is measured. The intention is to visually examine trends or patterns of the input (x) onto the response in the experiment. The chart below would indicate a weak negative linear correlation. From here the Coefficient of Correlation can be determined as well as best fit line to describe the behavior of the data. 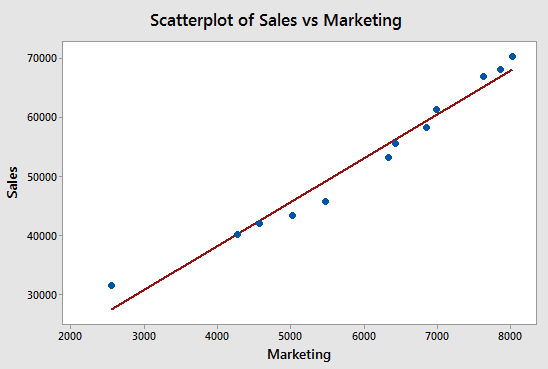 There are no assumptions of normality or sequence to use a Scatter Plot. Sequential plotting is required for a Time-Series plot. It is most useful when there is a lot of data in table and very difficult to tell if there is any type, and to what degree, of correlation. As association of variables does not always imply cause. There could be other lurking variables effecting the measured "y" response. A scatter plot of the blue dots shown below makes it very obvious that there is strong positive linear correlation but it does not provide any value other than a visual indication. A Scatter plot itself is limited in its use but is rather a starting point for further analysis of correlation and regression. This is another one of the many visual tools (such as a Box Plot and Pareto Chart) that a Six Sigma project manager can use to show the team that helps break down data into more meaningful terms. Line charts are similar to Scatter Plots but contain lines connecting the data. The chart above is an example of the value of the plot. Simply looking at a set of x-y data on a sheet would be a challenge to see this relationship. 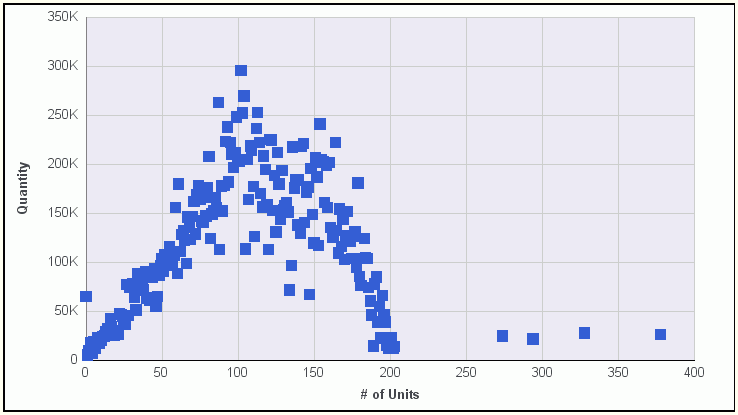 There appears to be a strong non-linear with a few outliers within the range of 0-200 units.